Perthshire has a long golfing legacy, indeed it is ironic that James IV of Scotland, who tried to ban the game as it conflicted with archery practice, made the first recorded purchase of golfing equipment - a set of clubs from a Bow Maker in Perth in 1502! This golfing heritage and recent course developments ensures that there is a wide range of options for golfers of all ages and abilities. Choose from scenic Highland layouts, idyllic parkland settings, world famous centres such as Gleneagles and Rosemount at Blairgowrie and many 'hidden gems' spread throughout the area. The main challenge won't be navigating your way successfully around the course, more keeping your eye on the ball amidst such stunning surroundings. The club's existing courses, Ferntower and Dornock, stretch over the restorative grounds of the Hydro, the grand Victorian Spa, which opened in 1856. Since the mid 19th Century, visitors seeking refuge from the encroaching cityscapes of Edinburgh and Glasgow have assembled on Crieff's rugged Highland line;once an ancient frontier settlement and market town, Crieff maintains its reputation as a place of gathering. Established in 1912 and reopened in 1935 by Jessie Anderson, later Jessie Valentine the three times British Ladies Amateur Champion. An undulating parkland course, with narrow fairways, small well bunkered greens and picturesque views of Strathearn and the Grampians. It is a challenge for golfers of all handicaps. Situated in Perthshire, six miles from the Gleneagles Hotel golf complex, venue for the 2014 Ryder Cup.This nine hole golf course with a friendly welcome caters for visitors and parties and the clubhouse has catering during the season. Comrie golf course is situated in the most beautiful part of Perthshire, on the A85, close to the village. The course consists of nine holes with magnificent views over the Strathearn valley. There are some notable par three holes, the third and fifth, which requires a good accurate tee shot to reach the green. The ninth tee shot is played through an avenue of trees. The greens are always in excellent condition, and the club is proud of the quality of the course for playing golf. Golfers of all abilities will find it a challenging experience to play Comrie golf course. Perthshire has some of the best fishing in Scotland. On the river Earn in nearly all weathers you can find many people trying their luck during the fishing season. If some of the members of your group prefer cycling or walking there are some beautiful on and off road tracks within striking distance. Crieff Hydro also has an off road quad and 4x4 track which is popular with both residents and people staying in nearby accommodation. Merlindale is only a stone’s throw away from all the above activities. Cliff jumping white water rafting or even a micro light flight is within less than an hour from Merlindale in Crieff and we can usually give you contact numbers etc on how to get hold of any of these activities. If you love nature the Highland Adventure Safari near Stirling is only 30 minutes away from Merlindale in Crieff by car. It is a great day out for both adults and children and for a family the cost is quite reasonable;certainly value for money. Again any information you need regarding this day out can be obtained from Merlindale in Crieff. If the North Sea Coastline or the magnificent Tay River and Estuary is the kind of scenery you like, then within a quick drive from Merlindale in Crieff, you may be amongst some of the most spectacular scenery within the British Isles. The Grampian Mountains with their unspoilt glens can be seen from the top floor of Merlindale;all of these are again within striking distance. Crieff being very central draws people from all over the world. Morison’s Academy and Ardvreck as well as Glenalmond and Dollar are all well known schools within the vicinity. Many foreigners send their children here for an example of what British Education can be. Gleneagles is only 10 minutes away and boasts a number of activities. From golf to outstanding dining, falconry and even croquet, these are just a few of any number of activities open to you at Gleneagles. Here you'll find some of the best cycle routes in the UK if not in Europe! The magnificent panoramic views, diverse wildlife and miles upon miles of little used routes throughout the area’s 2,000 square miles will enliven your every sense. You can choose between routes which roll gently over rural south Perthshire and onto the Fife Millennium cycleways, or rugged Highland tracks and quiet roads in the north and west of the area. Perthshire is a destination for all seasons, but if you want stunning scenery and vivid colours, come cycling in autumn when the tree-lined hillsides and glens are resplendent with their coat of blazing coppers, orchres and golds. Off-roaders are well-accommodated for too. Here you will find an extensive selection of little used Highland forestry and other tracks, many of which are close to the main A9 road route north. In the area you'll find over 35 different adventure activities, that are guaranteed to get the heart pumping, send the adrenaline levels soaring and keep you coming back for more! Crieff is only around an hour from Edinburgh or Glasgow by car so what are you waiting for - get some friends together, escape the 'weekly grind' and test your limits and revitalise your senses in one of the most stunning and accessible parts of Scotland! Whatever the season Perthshire has some magical views and our ever changing landscape has a truly mystical quality. 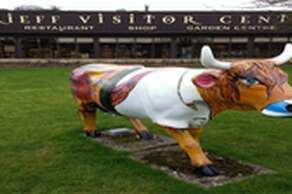 Crieff Visitor Centre was opened in 1984 as an outlet Shop and Restaurant by the owners of Perthshire Paperweights and Buchan pottery. Both companies were important employers in the town and felt that within the Visitor Centre they could showcase and sell their products. By 1990 the site had been expanded to include the Garden Centre, which is very popular with local enthusiasts to this day. In 1999 Crieff Visitor Centre was bought over by the current owners, the McLaren Family. Stuart McLaren, Managing Director, has over recent years invested in the development of the site with the installation in 2002 of the Highland Drover’s Exhibition, the re-location of Caithness Glass from Perth to Crieff Visitor Centre in 2007 and a large-scale refurbishment of the Restaurant in 2011. Nothing has ever been ordinary about The Glenturret, Scotland’s oldest working distillery. Since its origins among the smugglers and illicit stills of the 18th Century, it has had some fascinating stories to tell. Whisky booms and prohibition might have ruffled its feathers, but The Glenturret scotch malt whisky, still made by hand in the traditional way, weathered all these challenges and has matured into an enduring brand that remains as the only traditionally hand-mashed whisky in Scotland. These days Glenturret’s doors are open to welcome over 70,000 visitors per year, a 5 star visitor attraction, it’s the perfect place to brush up on your whisky knowledge with a tour of The Glenturret Experience, and indulge your passion with a selection of tastings. Steeped in 240 years of history, Glenturret Distillery is the oldest working distillery in Scotland, and still a thriving business today with an average of 80,000 visitors every year. Nowhere is the phrase “time-honoured”more appropriate than at Glenturret Distillery which has a heritage dating back to 1775. That’s the year before America achieved its independence, and a time when Scotland’s National Bard Robert Burns was still in his teens. Established in 1775 as a single malt distillery by John and Hugh Drummond, Glenturret was the first of several distilleries drawn towards the soft and pure waters of Turret Burn in the Perthshire countryside. It wasn’t until the 1950s that the distillery was revitalised by whisky enthusiast James Fairlie. And building on this renaissance, three decades later it opened as a visitor attraction in 1980. In 2002, Glenturret became the home to The Famous Grouse Experience –a unique, interactive whisky experience –and spiritual home of the brand, in 2018 it reverted back to The Glenturret experience. Now an award winning five-star visitor attraction, The Glenturret Experience invites guests to experience the handmade distilling processes that have been used to craft the malts of Glenturret Distillery for generations. The distillery team continues to follow the same traditions, using authentic methods and traditional equipment.